Capt. Greg Voliva has headed up to Oregon Inlet with Capt. 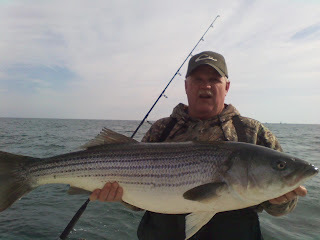 Joe Ward for some striper fishing, they caught 60 of these in a couple of days. If you want in on the action, drop us a line and we'll put you together. I went from catching striped marlin to looking for striped bass. Although I saw a few at Cape Lookout on New Year's Eve, it doesn't look like we've got a shadow of what is going on up at Oregon Inlet.